Iosif Romualdovich Grigulevich (Russian: Иосиф Ромуальдович Григулевич; May 5, 1913 – June 2, 1988) was a Soviet NKVD Operative between 1937 and 1953, when he took a leading role in assassinating Communist and Bolshevik individuals who were not loyal to Joseph Stalin. Under a false identity as Teodoro B. Castro, a wealthy Costa Rican expatriate living in Rome, Grigulevich served as the ambassador of the Republic of Costa Rica to both Italy and Yugoslavia (1952–1954). His mission as an agent was to assassinate Yugoslav leader Josip Broz Tito but was later aborted by Stalin's death in 1953. Grigulevich then settled in Moscow, where he worked as an expert on the history of Latin America and on the Roman Catholic Church. He was a member of the Soviet Academy of Sciences, served as editor-in-chief of the magazine Obshchestvennye nauki i sovremennost ("Social Sciences Today"), and published many books and articles about Latin American subjects. Grigulevich was born in Vilnius, Russian Empire (present day Lithuania), to a family of Crimean Karaites. His parents emigrated to Argentina when he was young. His father did well for himself and later sent Iosif to Europe to study. However, some sources claim that only his father moved to La Clarita, Argentina and he and his mother remained in Trakai, Lithuania, where he joined the Polish Communist Party and became acquainted with Edward Gierek, not travelling to Argentina until 1934. In any case, in 1933, he studied briefly at the Sorbonne. He was recruited by the NKVD and showed a gift for languages, soon picking up English, Spanish, French and Russian. In the late 1930s, Grigulevich was sent to Spain to monitor the activities of the Workers' Party of Marxist Unification (POUM, the militia with which George Orwell served), during the course of the civil war in that country. Grigulevich worked under NKVD general Alexander Orlov, using the code names MAKS and FELIPE, and organized so-called "mobile groups" that killed, among other actual and suspected Trotskyists, POUM leader Andrés Nin. In this mission Grigulevich apparently collaborated with the assassin Vittorio Vidali, known in Spain as "Comandante Carlos Contreras." After the failed attempt to assassinate Trotsky, Grigulevich and two of his accomplices (Laura Araujo Aguilar and Antonio Pujol Jimenez) were helped by Pablo Neruda to escape from the Mexican police. Later, Grigulevich was sent to Argentina under the code name "Artur", where he remained during World War II and organized anti-Nazi sabotage operations. He married a Mexican woman named Laura Araujo Aguilar, who was also a Soviet secret agent, operating under the code name LUIZA. The Yugoslav head of state, Marshal Tito (left), receives the Costa Rican ambassador, Teodoro B. Castro (right), on April 27, 1953. Ambassador Castro was in fact a Soviet illegal agent, Iosif Grigulevich, who, under orders from Stalin and the NKVD, was plotting to assassinate Tito. In 1949, with the help of Joaquín Gutiérrez, a Costa Rican writer who harboured very pro-Soviet and Communist sympathies and who worked in his country's diplomatic corps, Grigulevich procured a false passport identifying him as Teodoro Castro Bonnefil, and settled in Rome. Grigulevich pretended to be the illegitimate son of a wealthy Costa Rican coffee producer and styled himself Teodoro B. Castro (using a middle initial in the "American manner"). He successfully established an import-export business in Rome and made extensive personal contacts with business figures and prelates of the Catholic church. He also became a friend and business partner of former Costa Rican president José Figueres and in 1951 "Teodoro B. Castro" was appointed as chargé d'affaires of the Costa Rican embassy in Rome, serving also as advisor to the Costa Rican delegation to the sixth session of the General Assembly of the United Nations, in Paris. In 1952, he was appointed as ambassador to both Italy and Yugoslavia. In the meantime, Grigulevich was secretly granted Soviet citizenship and membership in the Communist Party of the Soviet Union. In early 1952, the Soviet intelligence services assigned Grigulevich the task of conducting the assassination of Yugoslav leader Josip Broz Tito, who had broken with Stalin in 1948 over his insistence in maintaining Yugoslav independence from Soviet control (see Tito–Stalin split). 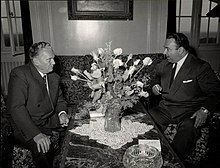 In his role as the Costa Rican ambassador (he presented his credentials on April 25, 1953), Grigulevich met with Tito on several occasions, but the death of Stalin in March 1953 interrupted the assassination plans and Grigulevich was eventually summoned back to Moscow, marking the end of his career as a Soviet secret agent. In Rome, the sudden disappearance of the Costa Rican ambassador, along with his wife and daughter, created a stir, with rumors of Mafia involvement circulating in diplomatic circles. In Moscow, Grigulevich settled into a new life as an academic. He was awarded a doctorate in history without having to defend a thesis and worked as an expert on Latin America and the Catholic Church. He was the author of 58 books, some of which were published under the pseudonym Iosif Lavretzky (Лаврецкий). In 1976 he wrote a biography of Che Guevara. In 1979 he became a corresponding member of the Academy of Sciences of the USSR. Colleagues were puzzled by the lack of any biographical information about him prior to his forties and by his refusal to be photographed. 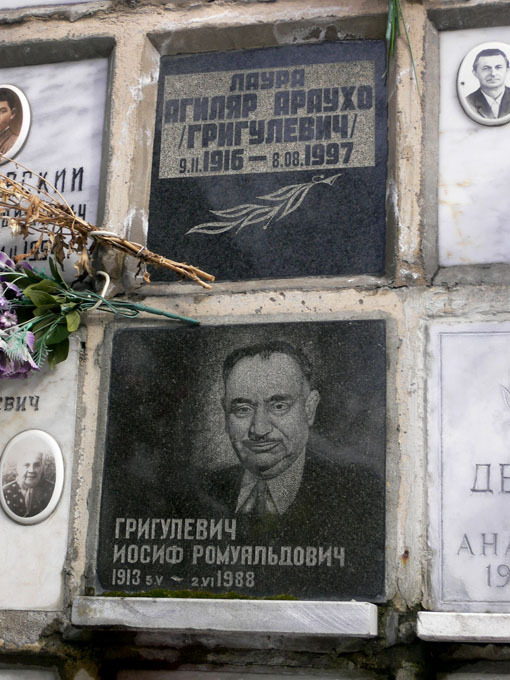 The details of Grigulevich's role as a Soviet agent were clarified only after the fall of the communist regime, particularly with the release of the so-called "Mitrokhin archive" in the mid-1990s. ^ Patricio (4 April 2012). "El agente secreto Iosif Grigulevich". ^ Thomas Hugh, The Spanish Civil War, revised edition (Harper & Row, New York, 1997) ISBN 0-06-014278-2. ^ Kern, Gary (2004). A Death in Washington: Walter G. Krivitsky and the Stalin Terror. Enigma Books. pp. 291–292. ISBN 978-1-929631-25-4. ^ Boris,, Volodarsky,. Stalin's agent : the life and death of Alexander Orlov (First ed.). Oxford. p. 366. ISBN 9780199656585. OCLC 869343535. ^ a b c Christopher M. Andrew and Vasili Mitrokhin, The Mitrokhin Archive: The KGB in Europe and the West, (Penguin Books, London, 1999) ISBN 0-14-028487-7. ^ Marjorie Ross, El discreto encanto de la KGB: las cinco vidas de Iósif Griguliévich, (Farben/Norma, San José, Costa Rica, 2004) ISBN 9968-15-294-3. This page was last edited on 13 March 2019, at 21:58 (UTC).